Best Budget Smartwatches which you can use as an alternative to premium smartwatches like Apple watch, Samsung Gear or Peeble. We have to tell you a truth, smartwatches are still new gadgets that still has to attack and conquer the world of tech. Before they were made, people wore traditional watches, but still younger generations didn’t see traditional watches as the part of their style. Watches were here to present your sophistication, vogue, and style for both formal and informal setting. Smartwatches made things even better because they are today unisex and you can blend them in almost everything that you can wear. They possess and present male and female urbanity. In this progressive world, we had to find a way to enhance our past with technology features. That is why you should consider purchasing smartwatches. Of course, there is always a catch with the latest technology. The price tag was enormous and therefore they were available for people who can afford them in the first place. At the very beginning, they were part of the luxurious way of life, where you had to pay over $500 for one watch. Today, we live in different times where there are numerous companies that decided to make affordable smartwatches that you can purchase under $100 in 2018. Xiaomi has provided some flagship smartwatches like Xiaomi amazfit, Amazfit 2 which were a hit all over the world. However these Smartwatches were not suitable for a budget buyer. Xiaomi this time come up with affordable Amazfit Bip Lite version. 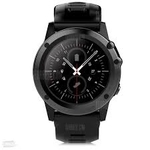 This particular smartwatch doesn’t work on the Android operating system, but you can easily connect it via Bluetooth to any device such as iOS and Android ones. 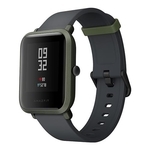 The best thing about Xiaomi Amazfit Bip is that it is affordable and you will be able to purchase below $100 which is perfect when compared with similar smartwatches with same features. This rectangle shape smartwatch is perfect for health conscious people. It has features like pedometer, heart rate meter, GPS. However the best part of Amazfit Bip is it’s long life battery back-up. You will get more than 30 days battery back up on single charge!!! The smartwatch comes with a soft rubber strap, however you can change the starp according to your choice. Even after launching Amazfit 2 and Amazfit Verge from the Xiaomi, this smartwatch still the most popular smartwatch from the company till the date. The Alfawise company mostly known for its Smartphones, Tabltes, and many smart gadgets. This time company also tried its hand in the smartphone market. Alfawise KW88 Pro is the first smartwatch from the company. 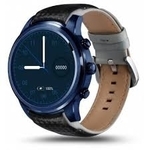 The popularity of this high end smartwatch can only be seen after passing of a few months of 2019. KW88 Pro powered by MTK6580 Quad Core processor and you can also use it as a smartphone. It contains 1 GB of RAM and 16 GB of internal storage, so you can easily store as many files as you need. The size of the touchscreen is 1.39 inches which perfectly suites to any wrist. It also has 2 MP HD camera in order to record videos and take pictures. It is built with Android 7.0 and you can also upgrade it online. The best thing about it is the battery (350mAh) that can work for a day without any additional problem. The Best part of this smartwatch is that it is having tonns of premium theme, which make it different from other cheap smartwatches. Smartwatches are changing rapidly and taking different forms and additional features. Finow Q1 Pro is the first Chinese smartwatch with the 4G Support. This 4G Smartwatch contains all features as high-end models however you can purchase it for under $100. When it comes to design, Finow Q1 Pro have elegant and sporty looks that you can match with everything. It comes with colorful replaceble silicon starps. It is a Waterproof Smartwatch, so you can wear this smartwatch in all weathers!! Inside there is a quad core MTK6737 processor that works with 1.3 GHz and internal memory of 8 GB and 1 GB of RAM. This is above capacity when you compare it with similar smartwatches, however, the main downside is that you cannot extend the memory further. It works with Android 6.0 and it is compatible with both Android and iOS devices. Smartwatches are today an indispensable part of our technological advancement. You don’t have to worry anymore because we decided to present you the best affordable smartwatch on the market. Its display is very impressed with the size of 1.39 inches and AMOLED round screen that will provide you vivid and bright display even in sunlight. It is made with great feel and aesthetics, which will give you both great features and elegance while you are wearing it. It is powered by Android 5.1 and it supports App Store where you can download different apps. You can also multitask and run different background applications, which means that you can simultaneously play games, see pictures and listen to music. It comes with quad-core 1.39 GHz CPU, 4GB of internal storage and 512 MB of RAM. When we compare this hardware and configuration, you won’t have any battery problems. On the other hand, the battery is perfect and you don’t have to worry because it can last 2 days without any additional problem. It supports connectivity to both iOS and Android devices It has only 4 GB of internal storage and it doesn’t support SD memory card. Microwear H1 is one of the most popular Chinese smartwatches that you should purchase for the affordable price. It is made of aluminium alloy and magnesium, in the same time cover is plastic which makes it firm to use. We have to mention the screen with AMOLED technology and 1.39 inches in size. You will enjoy in picture quality and colour transfer that will work on both sunny and rainy weather. The battery is removable which is way convenient when you compare it with similar smartwatches in the same price range. Classy unique design You cannot install additional apps. Battery can last up to two days with one hour of charging. 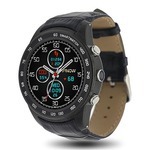 This particular smartwatch is an amazing choice that you can purchase for the affordable price. You can wear it wherever you want to go, because of its simplicity. The design is common, which means that manufacturer avoided creating unusual appearance, which means that it is unisex. 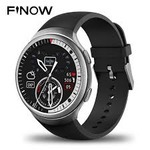 Finow K9 Smartwatch comes with 1.3 inches TFT display and 360 x 360 resolution per inch. It works on a great and speedy processor and 512 MB of RAM and 4 GB of internal storage that will give you the possibility to enjoy all the way. You can easily add Nano-SIM so that you can receive and make calls and send texts. It works on the Android operating system which means that you can enter Google Play Store in order to download the latest and interesting apps. It contains Bluetooth 4.0 connectivity so that you can sync it with your mobile device in order to get more features. You can enjoy in pedometer for additional activity and possibility to change its face according to your wishes. It is a great choice for all people that want to purchase an affordable smartphone with great features. Both iOS and Android supported It comes with little RAM memory, only 512 MB. You can enjoy Pedometer, Stop Watch, Barometer, Altimeter. 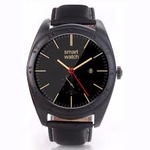 This particular smartwatch runs on 4.1 Android OS and a quad-core MTK6572A processor that works at 1.2 GHz frequency. You can easily connect it with 3G phones, and it also contains numerous features such as Bluetooth , Heart Rate monitor, Pedometer, Wi-Fi, GPS and much more. 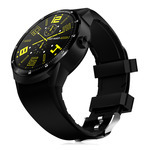 CACGO K98H Smartwatch also have nano sim facility, so you can insert a sim card and use this watch as a smarphone. 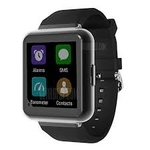 The main downside of this smartwatch is that it doesn’t contain camera and SD card slot. Even though it is not waterproofed, it is heavily protected o you don’t have to worry about damaging it. The coolest feature that you can choose is watched face. You can choose between digital and analog and there are lots of more available. The integrated speaker is clear and loud, but the microphone is muffled, so it is difficult to understand the other party. On the other hand, it provides great recording quality with recording application. With it, you will get native apps such as calendar, agenda items, but there is also a Play Store where you can download numerous smartwatch apps that could get used. If you want to purchase smartwatch that will give you the possibility to enjoy with amazing features and great build quality, this is the one that you should choose. Cacgo K89 is one of the most popular Chinese smartwatches and it is designed to be cheap and affordable. It contains optional fitness tracking features that will give you the possibility to train more efficiently. It runs on Android 5.1 which is great and you can easily access Google Play store in order to install the app on it. This is especially great because you will be able to customize watch faces and to make it better and prettier. It is quite reliable and perfect. The battery can work up to 24 hours after fully charging and it contains Bluetooth connectivity that will give you the possibility to sync it with a mobile device. It is built with stainless still and the band is comfortable. However Only downside with this watch is that it has no sim card facility. The display has 1.63 inches and 320 x 320 inches of resolution with the lowest brightness that is barely visible in sunlight and highest brightness where you can see everything. Finow Q7 Plus is a another great choice, it is considered as one of the cheapest smartwatches with premium features. It contains display with 1.3 inches and whole round system which is quite comfortable for wrist and 240 x 240 resolution. When it comes to configuration, we have to mention that it works with quad-core MTK6580 CPU with 1.3 GHz, and 4 GB of internal storage where you can keep your files. RAM memory is lower which is 512 MB, but still, it is quite affordable so that won’t matter. You can connect it with 3G mobile devices, and it works on single Nano sim that gives you the possibility to text and receives calls. You can add additional memory with IP65. It comes with numerous features such as GPS, Pedometer, QTA, Message, Weather, Music, Clock and it contains 2 MP Camera. It I very reliable and comfortable for wrist and you can make calls without syncing it with a cell phone. Kingwear GV68 watch is for those who prefer style over any other thing. The KingWear GV68 smartwatch has a classic rectangular design which gives it a classy, trendy look. The design of the watch is ecstatic and refreshing. This beautiful smartwatch available in various color options. You can change its detachable straps according to your mood. The best thing about this sporty smartwatch is “It is fully waterproof”. Smartwatches are not anymore thing of future because they are popular today. However, the main problem with them is that you cannot purchase them for an affordable price. That is the thing of the past because we have presented you top 10 best smartwatches under $100 that contain amazing features and beautiful looks. If you have questions or your own ideas about these particular smartwatches, feel free to comment in the section below and we will try to answer all your doubts. Cheers! Previous articleZeblaze Thor 4 Review: The Perfect 4G Smartwatch with Good battery Life!! Next articleTop 10 Best Top Notch Display Smartphones in 2018: Cheap iPhone X Alternatives!